Tired of digging into crowded Start Menu? 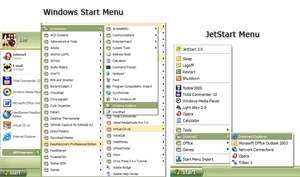 JetStart offers you a quick access to categorized Start Menu shortcuts, recently launched programs and system commands. Just point your mouse to the Start Menu button! You can also place your most used programs and documents into the handy toolbar and quickly run any program by typing few starting letters. For security reasons, you should also check out the JetStart Free download at LO4D.com which includes virus and malware tests. Additional screenshots of this application download may be available, too. JetStart Free download been highly rated by our users.